Congratulations to Kalyna, giveaway winner! You might recall colorful jewelry made by Dittany Rose in Cambridge, England that I first featured in a June post about stylish paper jewelry. 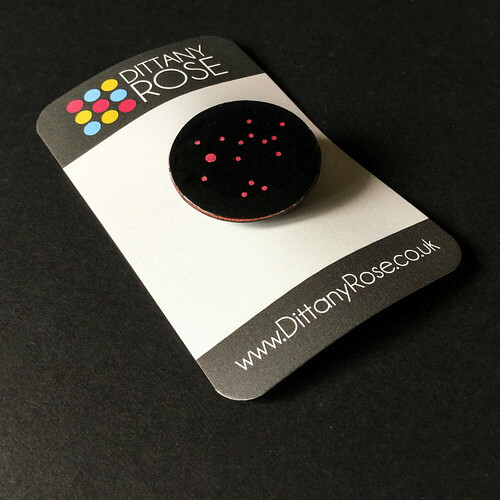 I've kept an eye on Dittany's Instagram feed and have been admiring her new Constellations range... earrings, brooches, and necklace pendants. 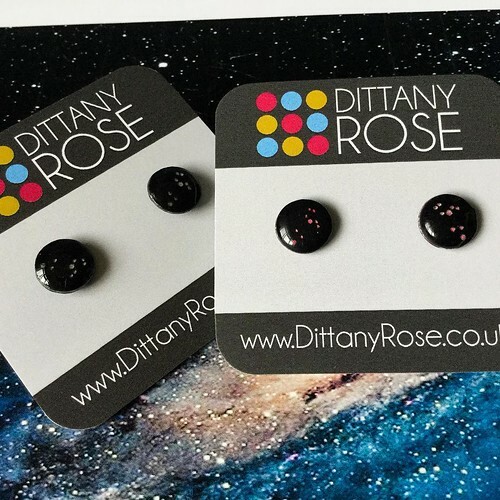 Curious about this eye-catching celestial jewelry, I reached out to Dittany to learn more. One thing led to another and the result is this interview and a giveaway! 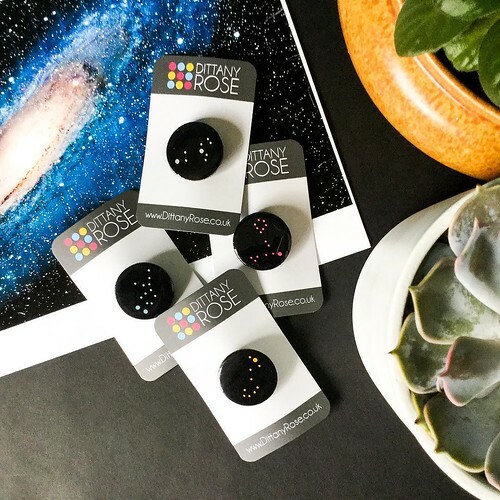 One lucky reader will receive a Constellations piece of her or his choice. Dittany, many in the U.S. are looking skyward and talking about the upcoming solar eclipse. 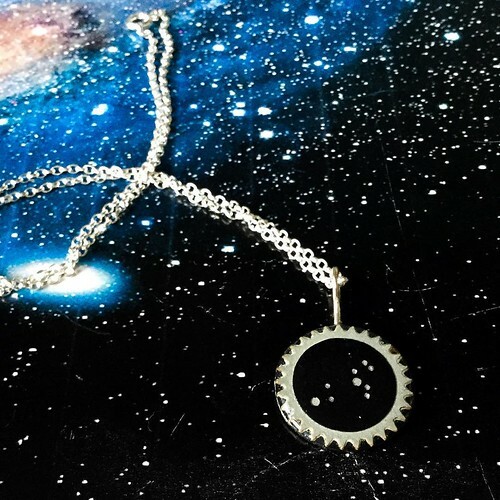 Your timing to design a space-related jewelry collection couldn't be better! I'm eager to hear why you created Constellations... do you have a special interest in astrology? I'd also love to know a bit about the process you use to make these pieces... you've mentioned on IG that they are quite labor-intensive. 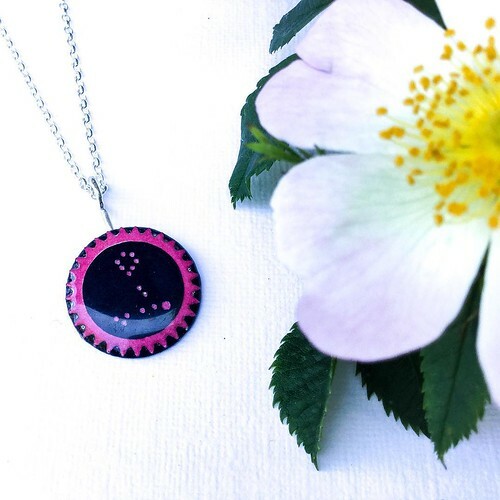 I launched my new Constellations range in July this year and it seems to have really caught people’s imagination. I’m getting a lot of love for them. Many designers will design something in a sketchbook and then set about working out how to make it. That is not how I tend to work. As with most of my work, my new Constellations range came about through experimenting with materials and tools to see what they can do. This is a way of working that was instilled in me on my jewellery degree at Middlesex University, London. This degree course, which ran for over 50 years was renowned for its non-traditional approach. All my current jewellery is a combination of paper, resin and silver. Paper is the key material: I love its versatility and it’s a material I keep coming back to in different forms. I use resin to cover the paper and make it durable and shiny. I use sterling silver for findings and links, either gluing them on or (my favourite pieces) trapping the silver between layers of the paper. These pieces are handmade by me at all stages. Although I use a laser cutter, I do the cutting myself which has allowed me to experiment. Once all the pieces are cut, it takes at least a week to make a set of pieces as each piece must go through a number of stages of laminating and pressing followed by coating with layers of resin that need to dry overnight. As well as loving paper, I’ve always had a thing for circles and holes; drawing them, cutting or drilling them into things, printing with them. It’s a simple idea that can give endless design inspiration. That’s how my Constellations range was born; by playing with holes, working out how to cut tiny ones on the laser cutter. 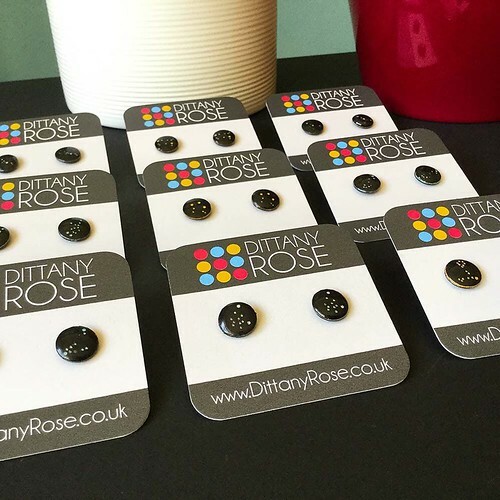 Once I’d got some initial ‘holey’ experiments, it was a comment from a friend that made me realise the holes needn’t be random and that they looked best done in black card, like the night sky. It didn’t take a huge leap of imagination to go ‘Ah Constellations!’ I’ve always loved the night sky - who doesn’t! So although you may expect me to be crazy into Astrology - I’m not! And for me that’s what I love about this range. Most constellation gifts are done in night sky deep blues. I’ve deliberately chosen four modern colours (Buttercup yellow, Bubblegum pink, Aqua blue and Silver) to represent the stars. This means that they work as contemporary design pieces and can be worn by people who may or may not be into astrology. My personal favourite designs are the brooches because the scale of the constellation pattern makes a really bold graphic. However, I love the tiny tiny stud earrings too - you’ll have to get up close and personal to see the design here. Right now it’s the pendants that are selling the best however. And now the international giveaway! One winner will receive her/his choice of a Constellations pendant, brooch, or pair of earrings. 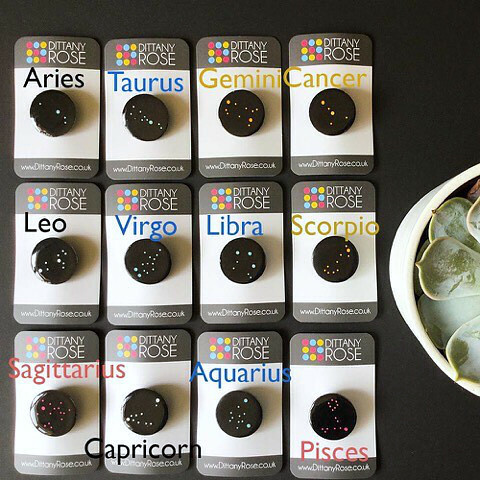 The winner will select from the color(s) currently available for that particular jewelry item/astrological sign. Visit the Dittany Rose Etsy shop to see the choices. 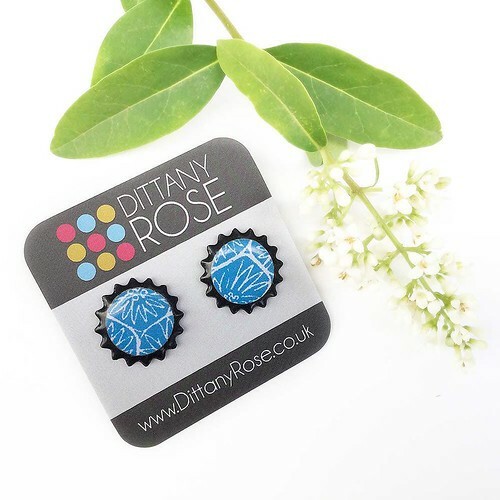 Dittany Rose also makes a range of patterned paper jewelry that features her own screen printed designs. You may enter on the Instagram giveaway photo as well. Enter at one or both places by the end of Saturday, August 19, 2017. One winner will be chosen at random from all entries, notified, and announced here and on Instagram. Good luck! Dittany Rose is on Etsy, Instagram, Facebook, and Twitter. 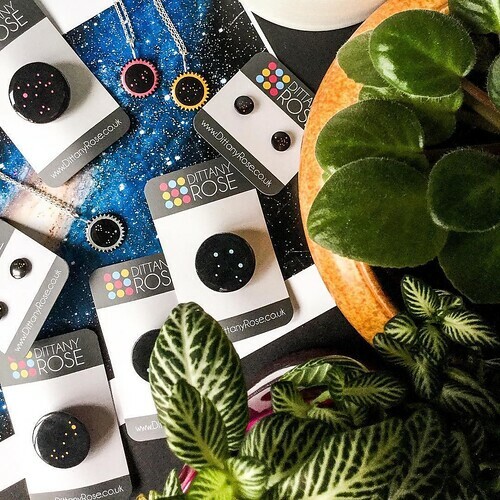 Terrific idea to create jewelry inspired by the constellations. Oh sparkly; can't resist. The brooch would look great on a denim jacket. How beautiful! I would love earrings. goodness, these are adorable! I LOVE LOVE LOVE all the designs but I would choose a pendant! great post today. I will be following Dittany Rose to see all of the beautiful work. These are so cool! Love the pendant! These are beautiful, I love the necklaces! I am a gemini and that would go so well with my nebula denim jacket (dyed to look like a nebula in space with white "stars" all over including a gemini constellation on the front).